The Cayman Islands, a group of coral islands lying about 90 miles (144km) south of Cuba, are one of the Caribbean's favourite holiday destinations - a beautiful beach paradise, jam-packed with excellent resorts, fine restaurants, friendly locals and some of the best snorkelling and diving sites in the world. The Cayman Islands consist of three islands: Grand Cayman, Little Cayman, and Cayman Brac. Most of the Cayman Island's best beaches and resorts, as well as most of its tourist sights and amenities, are found on Grand Cayman, and for many visitors this welcoming island has more than enough attractions to fill an entire holiday. However, those who do venture to Cayman Brac and Little Cayman will be richly rewarded for their efforts, as these picture-perfect, under-developed islands abound with natural beauty, and offer visitors a real opportunity to feel as though they've 'got away from it all' for a while. The two great attractions of a holiday in the Cayman Islands are the beauty of its beaches, and the quality of its snorkelling and diving sites. Seven Mile Beach, on Grand Cayman, is often described as the 'quintessential Caribbean beach', with powdery sand and warm, turquoise waters; while Rum Point features shady trees and is renowned for its rich marine life. The Cayman Islands are home to what are commonly called the 'best dive sites in the western hemisphere', and both novice and experienced divers will be spoilt for choice, with more than 100 sites on Grand Cayman alone. The islands are also home to a fine selection of restaurants, a wonderful climate, and a truly hospitable and charming local population - all elements that combine to make the Cayman Islands an obvious choice for an unforgettable Caribbean getaway. The weather in the Cayman Islands is good all year round, with plenty of sunshine hours and cooling trade winds to temper the sultry tropical climate. The peak tourist season is from December to April (the dry season). The rainy season runs from May to November, yet many actually regard this as the best time to visit the Cayman Islands, as room rates are cheaper and the beaches are less crowded; when it does rain, it usually comes in short, sharp bursts that clear up quickly. However, if you do plan to visit during the rainy season, you are advised to keep a close eye on weather reports in the days leading up to your arrival, as hurricanes remain a very real seasonal threat. Read more on Cayman Islands Climate and Weather. - Seven Mile Beach is pristine and gorgeous, and is backed by an array of top-quality restaurants and cafes. - Little Cayman is perfect for honeymooners seeking seclusion and tranquillity, featuring a lovely beach with pink sand and calm waters. - The Pedro St James Castle is the Cayman Islands' oldest surviving building and is known locally as the 'birthplace of democracy'. - The dramatic limestone cliffs and abundant flora and fauna of Cayman Brac inspired Robert Louis Stevenson's Treasure Island. - Go snorkelling in Jackson Point and the Devil's Grotto. - Visit Hell, a small village where black limestone rock formations are said to resemble scenes from the Underworld. - Take a sunset cruise on the Jolly Roger, a replica of a 17th-century galleon. - Head to the Tortuga Rum Cake Factory in George Town, and sample some of their famous fare. 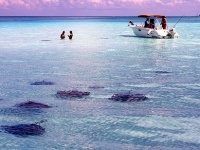 Read more about Cayman Islands Activities. Part of the Cayman Islands' enormous appeal as a beach holiday destination is its relative accessibility from American and British cities. Cheap flights to the Cayman Islands are easy to find from a variety of US cities, with the flight from Miami taking just 90 minutes. Direct flights to either Owen Roberts International on Grand Cayman, or Gerrard Smith Airport on Cayman Brac, are available from major British airports, with the flight taking about 11 hours. Get more information on Cayman Islands Airports. Treasure Island by Robert Louis Stevenson, Founded Upon the Seas by Michael Craton, and The Firm by John Grisham. Seafood like fish, turtle and conch. Cocktails made from local Caribbean rum. Tortuga Rum Cakes and jewellery made from black coral or Caymanite, the islands' own semi-precious stone. Pack plenty of sunscreen, lightweight clothing, after-sun lotion and effective insect repellent for a holiday in the Cayman Islands. The annual Pirates Week Festival (November) is a fantastically fun and colourful event, bringing fancy dress, street parties and cultural performances to George Town's harbour area. The Batabano Festival (April) features costumes and floats inspired by the marine life of the Cayman Islands, and centres around performances given by masquerading bands, who give voice to social issues with humour and creativity. More information on Cayman Islands Events. - The fictional island of Tortuga, from Disney's Pirates of the Caribbean franchise, is based on the Cayman Islands. - The Cayman Islands suffer more Atlantic hurricanes than any other nation. - Despite it's laidback lifestyle, Grand Cayman is in fact one of the largest offshore financial centres in the world. The Cayman Islands offer an ideal Caribbean holiday experience, with gorgeous white sand beaches, warm turquoise waters begging to be explored by snorkellers and divers, and a top-quality tourist infrastructure.